Michael Thomas Host // mth woodworks — Bench & Co.
Have you been to the back alley of 1000 Parker Street? If you haven’t, I recommend you check it out during this year’s Eastside Culture Crawl. Apparently, this is where the cool kids hang out. I discovered it when I went to visit Michael of mth woodworks a few weeks ago. The first time I saw the work of mth woodworks was at IDS in Vancouver a couple of years ago. It combines two contrasting materials, soy resin and salvaged wood, to create a striking balance of texture, colour and form. It feels fresh and contemporary, yet authentic. 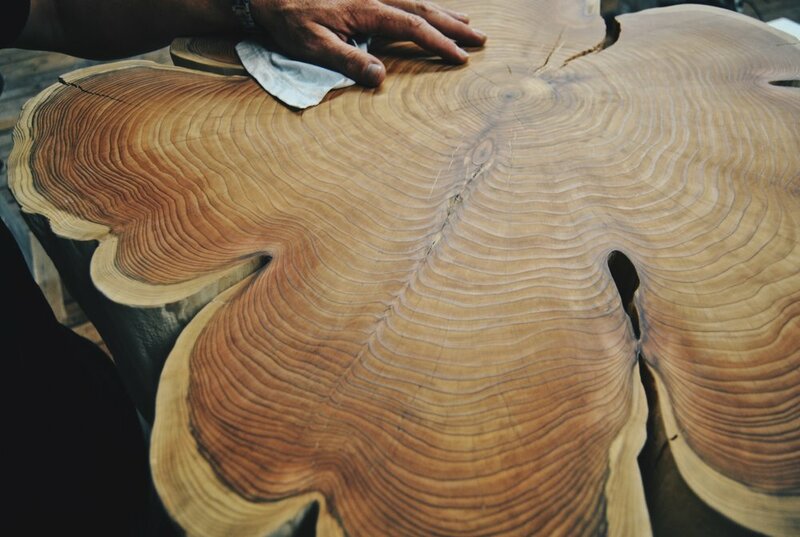 I love that the furniture pieces highlight the origin of wood and celebrate its history. When I stopped by the studio, I was intrigued to hear how this marriage of materials came about and find out what new products he’s been adding to the mix. Right now I’m working on a queen-size headboard. I just finished a credenza from my bloom collection, and I’ve got a table that’s going on a yacht in a couple of weeks. Since 2010. That’s when I decided to make my furniture full-time. Did you grow up in the area? I’m from a logging town in northern BC called Mackenzie. Its claim to fame is having the world’s largest tree crusher. It just plows the trees down and then weights them. I left there in 1988. So you learned how to work with wood in your childhood logging town? No, actually. In 2000 I went to visit my sister in Brooklyn for the week. The guy she was dating was a partner in a wood shop and they were looking for somebody to fill a spot. I decided to take it. I’d never worked with wood before and I didn’t know what I was doing. When I was in Brooklyn, I did a lot of solid wood furniture. Unfortunately, this area didn’t have the surplus of wood that the town I grew up in did. We would actually go out in the middle of the night in a rental van and cruise around to job sites looking for wood. We’d pay off security guys to let us load big beams into our van. Then we’d just run it through a machine and have beautiful material. It was the Brooklyn approach – we were like dirty sewer rats. Not quite the way things work now, but it was a great experience. I stayed in Brooklyn for two years. After that, I can back to Vancouver and did millwork around the city. What were you doing before you started doing woodworking? I was building boats – superyachts down in Delta, BC. I’m talking like 120-foot yachts. I went to Australia in ’99 and spent a year working with Riviera, the country’s largest luxury yacht builder. It was actually an awful job. I had to be suited up all the time and I was working with some pretty strong chemicals. But it did give me really good experience with all different kinds of epoxy resins and is probably what started the wheels turning for the work I’m doing now. When did you start mixing wood and resin? I used to date an interior designer. She had a connect out on Vancouver Island that was making stump tables and we had one in our apartment. We were hanging around and looking at this stump – there might’ve been a bottle of wine involved. We were trying to figure out how we could make this thing more functional. With my background in wood and resin, it just made sense to bring the liquid and the solid together. When I found a soy-based, eco-friendly resin, that was the green light to make it really happen. I ordered a batch of that and made the first few tables. The rest has been developed from there. I cast the first table in my friend’s garage in 2010. I didn’t really know what I was doing but right off the top I had some pretty high-end clients that wanted pieces, so I pushed myself to figure it out. Then I won designer of the year, so I quit my job as a millworker and took over this shop space. Where do you source the wood? Right now most of it is coming from the UBC research forest in Maple Ridge. The purpose of this research forest is to study how the trees grow, learn how to maximize yields, and determine what kind of grass planting can be done. Normally they’ll go in and log an area of cedar, and then I go in later and dig up the stumps. What happens to the stumps after you go to the research forest and collect them? I bring the stumps back to my studio for drying. I dry them by storing them in an enclosed area with a dehumidifier. As the moisture leaves the tree, it’ll shrink the radius of each tree. That’s why each stump has a crack, called a check, in it. Some people think the crack is a flaw in the wood but that’s actually one of the main things that has to happen before it dries out properly. It doesn’t affect the structural integrity of the final piece, and I kind of like the way it adds something. The drying process for each stump takes a year or two. When I bring the stump in, it usually weighs around 250lbs. By the time it’s done drying it’s around 50lbs. It loses a massive amount of water weight. Sometimes when it’s quiet in here at night you can actually hear cracking and the wood releasing moisture. After the wood is dried, what happens to it? It gets sandblasted. That gives it a really nice clean look. Then, depending on what application it’s for, quite often it goes to the router table station. It’s a really big router bit that I run along to flatten everything perfectly on both sides. My top seller this year is style number three – it’s essentially a stump turned upside down, routed out and filled in with resin. That involves a fair bit of freehand routing to create the pool for resin on top. Once it’s routed out, I put my (secret) engineered mixture inside to hold it stable. Then the resin gets poured wet. After all the resin is dry, it’s just a whole lot of sanding. This design I’m able to cast all at once. For the pieces with veneers, I do it in phases because it simplifies the process and I get a better product. When it’s finished, I apply a sealant. For high traffic tabletops, like restaurants, I use polyurethane. It’s super durable and versatile. On the smaller and residential tables, I use an oil wax. That’s hand-rubbed on and retains a bit more of the tactile nature of the material compared to a plastic coating. What’s your biggest challenge in this process? Keeping enough dried wood in my inventory. I can’t just go buy ready-to-use salvaged stumps. Generally the lead-time for a table is 6-8 weeks, depending on what’s available. Obviously I’m not going to dry something in six weeks so I always have to be thinking ahead. What’s the range of products that you create? Mostly a variety of tables. I’m getting into more wall-hung art panels. The resin and the wood react differently to moisture so I don’t do outdoor furniture, but I have done front doors. I’ve also made a sick bench. It was two stumps turned upside down with cast resin – it’s actually one of my favourite pieces. Did you have to learn a lot of new skills to successfully build this mixed-media furniture? Definitely. When I first started working with wood in Brooklyn, everything I touched was new. Every job was new. Over time I got really good at millwork installations and working with different types of wood. When I had to start making furniture on my own, I just had to figure it out. There have been some pretty hilarious gorilla moments though. A client sometimes has no idea what it took to get to the end goal. I just want to focus on what I’m good at. I’m still hesitant to turn down any work, but I do every now and then. I know it’s a luxury to be able to do that. I don’t want to go back, I want to go forward. It’s been an evolution and I want to continue that. I don’t know what’s going to happen next but I’m excited about it. I’m seven years in and I haven’t had to shut my doors. It’s pretty nice to have a job that you love. I’ve also started working with a company just across the street that does laser cutting. Basically, they’re taking the end-grain veneers and cutting different shapes out of them. I just did this really sick one of Haida Gwaii. The whole island chain was cut out with a laser and then cast into a white panel. So doing more of that is something I’m really excited about. So you can take this organic form of wood and laser cut any shape you want out of it before embedding it into the resin? Exactly. So it could be an art piece for the wall or even a tabletop. It’s a really good conversation starter. I started with maps. Everyone loves maps – there’s a draw to them. It’s real. I was just up at Desolation Sound on my dad’s boat and we stared at maps for like three hours. There’s something about that overview. Why do you enjoy using stumps so much? It’s fascinating to me to get a real look inside the trees. You can see what year it was growing and what year it wasn’t. It’s a fresh perspective that you don’t often get. I’ve got a piece here that has really tight rings. I think there’s something like 944 years on it. This was a massive, massive old red cedar tree. It’s just a testament to the life and the energy of the tree. Are there other new materials or techniques that you want to experiment with? Every day is a little bit of a learning curve. It’s taken me a few years to learn the ins and outs of the soy resin, for example. I’ve got her down pretty close to a science now, and that feels good. It takes some of the guesswork out of it. It used to be that sometimes I cast a piece, pop it out only to find some weird things happening on the surface. It takes time to work through that stuff. You can’t really force it. That’s also part of the reason I’m not too worried about people copying my style. There are so many things I’ve learned that go into making a superior product. It’ll be a long road for anyone to figure it out. It’s definitely an original product. What’s the biggest reward for you? Making beautiful things and giving myself the life I’ve always wanted. It’s a really good feeling to make something sick that makes a client happy and then go surfing. It’s also nice to get feedback when pieces are living in a space. I sent a huge ten-foot by five-foot table to France about a year and a half ago. The owner sent me pictures of it in her beautiful Chalet – it’s stunning. To send off a piece of West Coast history to places far away and get our style out there is pretty cool. Is there any advice you would give to someone just starting out? Well the biggest thing for me was that it started as a hobby, and I would recommend doing that first. If you love it just do it, but you don’t have to take the leap right off the bat. There’s always room for it to grow organically. Keep it real, man! Have fun! That’s the main goal. We’re here today, but we’re not sure about tomorrow.